Sally Hawkins (recently seen in the brilliant PADDINGTON 2) is on superb form here as Elisa, a mute cleaner at a top secret US government facility. 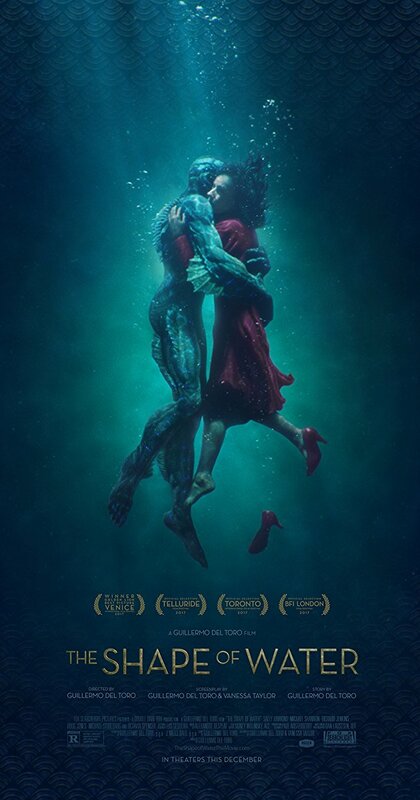 And that’s the first thing that really appealed to me about THE SHAPE OF WATER – its key characters are the kind of people I’ve long waited to hear tell their stories. I’m a sucker for 1950’s B movies featuring giant monsters and shrinking men and the like, and I’ve always looked at the settings for these films and thought who built that massive hidden underground silo, and who keeps it clean? Who designed the hardware that’s keeping that monster locked away? Who maintains the weapons which are defending this city from alien attack? Okay, so my questions are deliberately tongue-in-cheek, but you catch my drift – watch any James Bond movie with a power-crazed villain housed in a superbase fortress. How did it get there? Who designed and built it? Who sweeps the floors? Who prepares the food? You’ll have heard me going on about how my books are about ordinary people trapped in extraordinary situations… THE SHAPE OF WATER is about (relatively) ordinary people who just happen to work in an extraordinary place. The other cast members are equally strong, particularly Octavia Spencer as Elisa’s close confidant Zelda, and the ever-brilliant Michael Shannon as the movie’s big bad. Del Toro stalwart Doug Jones is again at the same time both completely unrecognisable and unfailingly familiar as the amphibian creature with whom Elisa forms an improbable yet completely believable bond. As with every del Toro movie, production design here is top-notch. The top secret Cold War base is beautifully realised. The creature design also hits the mark, with the amphibian taking cues from THE CREATURE FROM THE BLACK LAGOON without appearing overly derivative. But as with all great movies, it’s characters and story which are front and centre here. The premise of THE SHAPE OF WATER becomes more implausible the longer you think about it, so don’t. Just sit back and enjoy an exceptional film and revel in the fact that a homage to black and white rubber suit monster movies won big at the Oscars this year. Thoroughly recommended. Tagged Cronos, David Moody, Doug Jones, Guillermo del Toro, Hater, Hellboy, Michael Shannon, Octavia Spencer, Pacific Rim, Pan's Labyrinth, Post-Apocalyptic Movie Club, Sally Hawkins, The Devil's Backbone, The Shape of Water.